Only a half smile for the Hobbit! So last night I finally got around to watching The Hobbit. Most people I am acquainted with know that the Lord of the Rings Trilogy and Final Fantasy Advent Children are my two favourite films of all time. They are the only films that I have watched more than 5 times each, but yet still continue to find new details in each time I do. 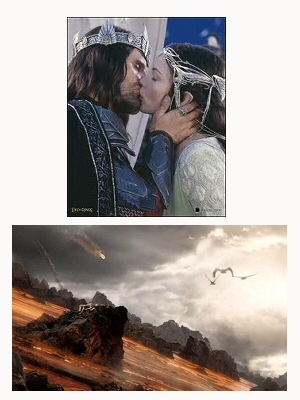 I was captivated with Lord of the Rings. I’d not read the books at that stage so I was looking at everything with fresh eyes. I fell in love with the scenery, the characters and the weaving storyline. I felt cheated when the first movie ended and I realised I was going to be forced to wait a whole year for the second instalment, and likewise when it ended and I had to wait for the third. Now I have the DVD’s, marvellous invention, I find I cannot watch one without having to watch the other two as well. I have to admit that sometimes this tomboy is a shameless girl, as I always cry in the third movie when the Eagles rescue Frodo and Sam from the mountain after they have destroyed the ring and while being crowned as King Aragorn realises Arwen is still alive. I have also made it known that I want Into the West played at my funeral when it is my turn to shuffle off this mortal coil! So I was excited to see the Hobbit. The trailer was a teaser indeed as it had left me wanting more, but it was a long wait until the films actual release date. When the time came I was still recovering from the knee surgery and didn’t feel ready to go to the cinema, preferring instead to wait for the DVD release. When DVD release date came I decided not to buy it just yet and opted to rent it from Blinkbox instead. It had been sitting in my library section there for about 2 weeks until yesterday, it’s just not easy finding a spare 3 hours these days. I watched it and found I was disappointed, but I am not sure I can tell you why I was, because I am not really sure myself. Although the music is still by and large the same as LOTR, the scenery and the effects as visually stunning and there are characters we have encountered before, it just lacked a certain something for me. Don’t get me wrong it was watchable and I enjoyed it as I am sure I will the others, but I don’t know if at this stage I would be rushing to buy it or watch it again. I didn’t fall in love with the new characters. I smiled when I saw Frodo, Gandalf, Elrond and Galadriel and awww’d when I saw the Eagles, but I felt that’s what I was doing, I was waiting for flashes of Lord of the Rings and they were just not there. Most of the actors have been in various other things I have watched and they are all amazing actors, but I wondered if this was also part of the problem, I am to used to them being in other things and found it difficult to differentiate between the two. So while I may have been disappointed, that should not take away from the fact that this is a visually stunning treat which will no doubt reap rewards. Perhaps I will fall in love a little more with each instalment. Only time will tell! I really liked the portrayal of Bilbo in the movie. However, Thorin Oakenshield is just different how I envisioned him in my many readings of the book. I loved the Lonely Mountain song that was sung at Bilbo’s. Almost moving as the charge of Theoden in Return of the King.